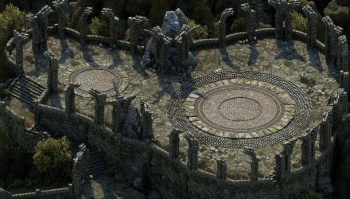 According to a recent Kickstarter update, backers can now expect Obsidian's Pillars of Eternity to release in winter 2014. Judging by the fact that it managed to raise nearly $4 million on Kickstarter, it might be safe to say that Pillars of Eternity (formerly Project Eternity) has a lot of people are excited for it. That in mind, Obsidian Entertainment recently had the sad duty of announcing that the game would not be finished in time for its originally planned Spring 2014 release. That said, backers and fans may be happy to know that Obsidian has announced a new launch window for the game that won't ask prospective players to wait too much longer to get their hands on the game. According to the announcement, made via an update on the Project Eternity Kickstarter page, backers and fans will only need to wait until winter 2014 for the game's release. While this is probably still a bit longer than many would like, it's less than it could have been given the studio's expressed desire to use the extra funds it acquired during its campaign to make a "bigger game" than its original budget of $1 million would have allowed. Honestly, as someone who contributed to Pillars of Eternity during its crowdfunding days, I'm actually kind of glad to see Obsidian taking its time to make the game everything it can be. Given the studio's sometimes rocky history with unfinished games, bugs and general QA, the additional months will hopefully mean a quality final product that's complete and running smoothly when it finally launches.